"Don't put all your eggs in one basket" is a common refrain. But usually it is not followed by the words "because your neighbours may kill you". However, this is precisely the scenario faced by some female Brazilian fig wasps – and a recent report of their "mortal combat" provides an intriguing, if chilling, example of how natural selection shapes animal behaviour. As Charles Darwin realised, individuals compete for limited resources such as food, territory or mates – and natural selection favours those adopting the most effective competitive strategies. Often a specific behaviour involves both costs and benefits – so, for example, foraging efficiently for food may expose an animal to predators. Trade-offs between optimising current and future reproduction are also common. For example, birds rearing many offspring one year may do poorly the next year. Consequently, we need to take a broad view of these behaviours and their environmental settings to understand why such adaptations are valuable. So when, if ever, would we expect to see mortal combat? In general, serious fights between animals of the same species are rare as several factors oppose risking death. For a start, a contested resource such as a fruit to eat may be of low value as there are likely to be others around. Second, in long-lived species (relative to the availability of resources) there is always the ability to wait until such resources are available again. And, even if the contested resource is rare and valuable, the contestants may assess each other's fighting ability and the likely loser will withdraw. In fact, general theory predicts that lethal combat betewen members of the same species should only occur over a valuable and limited resource. Now it just so happens that female fig wasps face a perfect storm of these circumstances. These tiny insects have an intricate symbiosis with fig trees and the females enter receptive figs to lay eggs in the flowers, which they also pollinate. Importantly, adult wasps live only 1-2 days and rarely leave the first fig once they have entered it. Their whole reproductive lives therefore play out in this one "tomb blossom" and the future doesn't come into the equation. They need to live fast, because they are going to die young. If a single female enters a fig, she has plenty of flowers in which to lay her eggs, but she often faces competing females. Derek Dunn of Northwest University in China and colleagues studied Brazilian Pegoscapus wasps on Ficus citrifolia. Each fig contained about 400 flowers and each flower can feed one wasp larva. 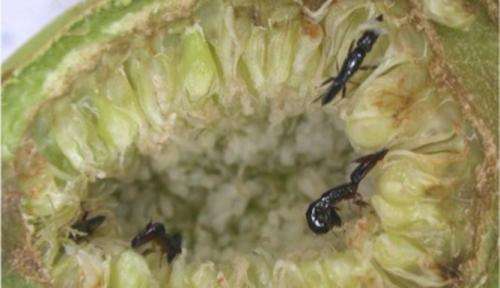 They found that, inside naturally growing figs, female wasps kill each other on a regular basis. Interestingly, they are not aggressive before they enter figs, nor do they fight immediately on entry. Instead, the trouble begins when one starts to lay eggs. This seems to trigger aggressive behaviour in the other females leading to a lethal fight, often involving decapitation. 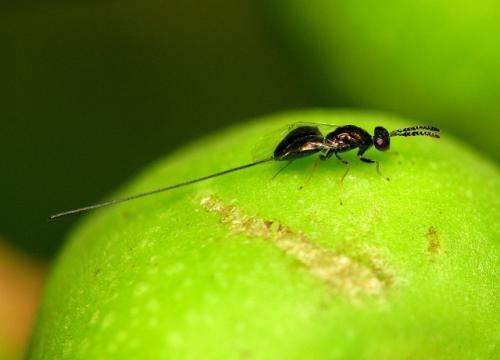 Examination of decapitated females inside figs then showed that they had laid fewer eggs than their rivals, so killing "neighbours" does appear to reduce competition for a female's offspring. Dunn's team then made a parallel study in Panama, where the same fig species is pollinated by a different Pegoscapus wasp species. Surprisingly, they found few decapitated wasps inside wild figs and the wasps were also not likely to fight in staged contests (unlike their Brazilian counterparts). So why the difference? The answer seems to lie in the intensity of competition. Reproductive opportunities for a female depend on how many eggs she has, the number of flowers per fig and the number of competing females. The first two factors differed little between sites, but on average there were three times as many females competing per fig in Brazil, tipping things in favour of a fight to the death. Mortal combat has been reported far more often for males than for females. Its occurrence agrees with the same general theory but the resource contested between males is usually mates (females). Intriguingly, fig wasps again provide some of the best-known cases. Lethal combat occurs in many species with wingless, short-lived males who compete intensely for the few available mates inside ripe figs before the winged females disperse. These fights commonly involve limb amputations and decapitation, adding to the macabre story of fig wasp fighting. In fact, when you consider that a single Ficus citrifolia tree may have a crop of several thousand fruits, with female pollinators killing each other in receptive figs and males of multiple species doing the same in ripe figs, every fruiting event is also a massacre.